Amazon.com description: Product Description: Notice: This is not the actual book Flash Boys: A Wall Street Revolt by Michael Lewis. Do not buy this Summary & Analysis if you are looking for a full copy. Get an indepth analysis blended with chapter summaries that will increase your understanding of Flash Boys and help you get all the bits that you may have missed. Why is it that the only person arrested after the financial crisis of 2008 is a computer programmer ultimately being prosecuted by the same large company that was involved in the financial crisis to begin with? In our analysis, we explain the changes that occurred in the regulation, technology, and business structure in Wall Street that made the environment ripe for collapse. Discover how Lewis shines a light on HFT, the ones truly responsible for the breakdown of the system if any one group of people can be. For years there have been urban legend style rumors of programmers able to build a computer program that would âcatch the pennies off of penniesâ. 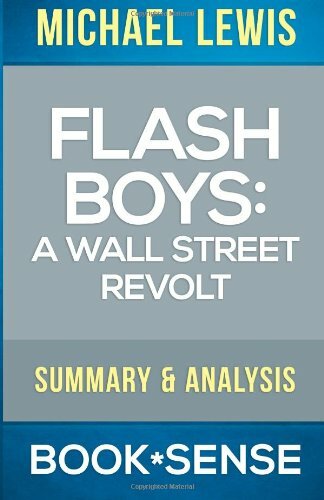 In this Summary & Analysis appears a review of Michael Lewisâ Flash Boys, discussion of events that set the stage for HFT, a list of significant characters, a chapter-by-chapter summary of the book and some concluding comments. Michael Lewis is able to bring to life characters in Flash Boys: A Wall Street Revolt that are already living without making the reader feel as if he is reading caricatures of real people. He delivers the facts of the story the same way that they would unravel in real time and takes the time between that unraveling to bring the reader up to speed on what the next development could mean. The result is a roller coaster ride of a thriller all in the confines of a true story event. Get everything you need to know in this short, concise and straight to the point analysis.